A vigil is set to take place on Sunday to honour and remember the victims of serial killer Bruce McArthur. On Friday McArthur was sentenced to life in prison without the possibility of parole for 25 years after he pleaded guilty to murdering eight men with ties to Toronto’s gay village. Many friends and family members of the victims expressed disappointment that Justice John McMahon did not sentence the 67-year-old to consecutive life sentences, which would have ensured that McArthur would remain behind bars for the rest of his life. Members of Toronto’s gay community have been critical of the way the Toronto Police Service handled the Bruce McArthur case, in particular, the disappearances of men they feel were ignored by police for years. 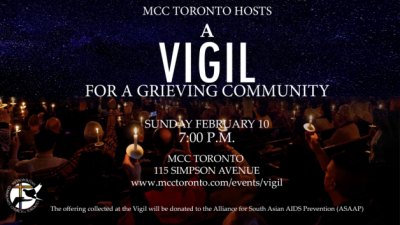 Sunday’s vigil is being held at the Metropolitan Community Church at 115 Simpson Avenue at 7:00p.m.